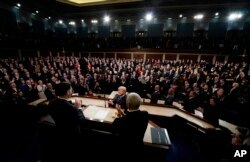 President Donald Trump delivers his State of the Union address to a joint session of Congress on Capitol Hill in Washington, Jan. 30, 2018. Calling North Korea a “depraved” and “cruel dictatorship,” President Donald Trump, in his first State of the Union address, again promised to exert “maximum pressure” to prevent Pyongyang from developing nuclear missiles that can threaten the U.S. mainland. “Past experience has taught us that complacency and concessions only invite aggression and provocation. I will not repeat the mistakes of past administrations that got us into this dangerous position,” said President Trump. However he was more restrained than at times in the past when he called North Korean leader Kim Jong Un “little rocket man.” He also did not mention the possible use of force, despite recent reports that the Trump administration is considering launching a limited military strike in response to a future provocation. “I don’t know whether this is good news in terms of the Trump administration opting for more diplomatic engagement towards Pyongyang, or the Trump administration is getting more serious about taking different measures, including some kind of military options,” said Bong Young-shik, a political analyst with Yonsei University's Institute for North Korean Studies in Seoul. President Donald Trump arrives to deliver his State of the Union address to a joint session of U.S. Congress on Capitol Hill in Washington, Jan. 30, 2018. In the last year, tensions between North Korea and the United States have escalated over Pyongyang’s efforts to develop a nuclear-tipped missile capable of hitting the United States. The Trump administration has led international efforts to impose harsh economic sanctions on North Korea, but has also emphasized that military force remains a viable option to deal with the growing threat to the U.S. mainland. South Korea's leadership has been advocating increased engagement to reduce tensions, and recently negotiated at least a temporary pause in North Korean missile and nuclear tests by persuading Pyongyang to participate in the upcoming PyeongChang Winter Olympics. The United States also agreed to postpone joint military exercises with South Korea until after the Olympic Games to accommodate the North’s peaceful participation. In his speech, Trump seemed to argue that there can be no compromise with the brutal and repressive Kim government. “We need only look at the depraved character of the North Korean regime to understand the nature of the nuclear threat it could pose to America and our allies,” said President Trump. The president recounted the tragic experience of Otto Warmbier, who died last year soon after being released from North Korea while in a comatose state. The American student was visiting North Korea in 2016, and was arrested for allegedly attempting to steal a propaganda poster. He was sentenced to 15 years hard labor but soon fell into a coma from which he never awoke. Warmbier remained in prison for almost a year without adequate medical care as his condition continued to deteriorate. 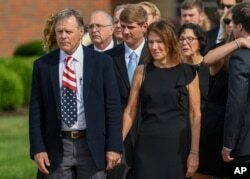 Fred and Cindy Warmbier watch as their son Otto's casket is placed in a hearse after funeral services, in Wyoming, Ohio, June 22, 2017. Trump also singled out another invited guest, North Korean defector Ji Seong-ho, as “one more witness to the ominous nature of this regime.” In 1996, Ji lost a hand and a foot when he fell from a moving train while stealing coal to barter for food, during a famine in which millions of North Koreans starved to death. He endured painful amputations and later torture before escaping North Korea on crutches. Ji is now a human rights activist with the group Now Action And Unity for Human Rights, and is involved in radio broadcasts into North Korea, where the state tries to restrict access to the outside world. “Today he lives in Seoul, where he rescues other defectors, and broadcasts into North Korea what the regime fears the most, the truth,” said Trump. Also raising concerns that the United States may be preparing preventive military action to deal with the North Korean threat are reports that Victor Cha’s name was withdrawn as nominee for U.S. ambassador to South Korea. Cha is a Georgetown University professor and former National Security Council adviser on North Korean affairs during the administration of President George W. Bush. Writing in the Washington Post on Tuesday, Cha said he shared his opposition to the preventive use of force against North Korea with White House officials while he was under consideration for a position.